Yup, I read two AVI books over spring break. 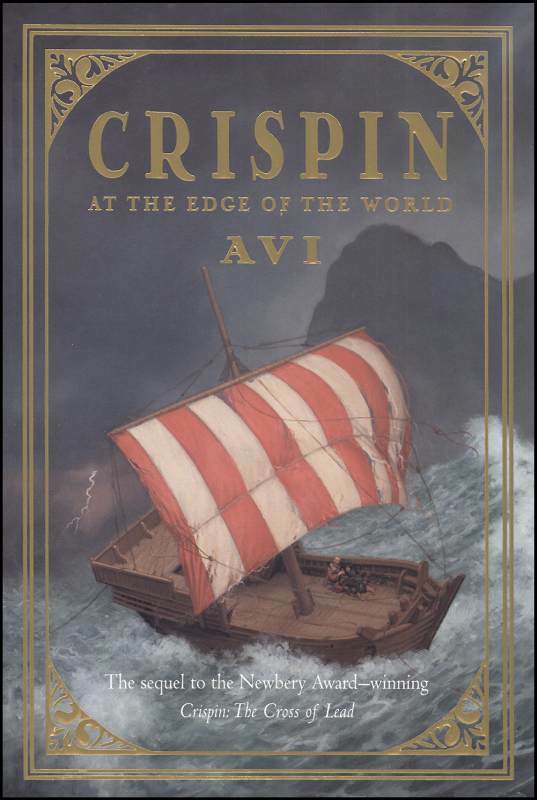 This is a sequel to his Newbery-winning book, Crispin: Cross of Lead (my review). It picks up immediately after Crispin and Bear make their way out of Great Wexley. (If you haven’t read book one, get thee to a library and read it. In the meantime, I won’t give any spoilers.) They are soon pursued and head for the busy port city of Rye where they might blend in and avoid capture. In route, the very innocent Crispin learns much more about the world he is a part of. He and Bear find themselves helped by an old crone who practices the ancient religions (pagan Celtic). This concerns Crispin greatly. How can someone who is not a Christian be so good while those who worship the Blessed Savior be so cruel? He is also frightened by a girl named Troth who has a “mark of the devil”, only to find a birth defect has little to do with a person truly is on the inside. Finally, Crispin and Troth must make sense of the brutality and senselessness of war. At the Edge of the World is a thought-provoking journey through medieval England. I thoroughly enjoyed the historical context, the much broader look we get at Bear’s character, and the childish perspective of an imperfect world. This is Avi at his best. Highly recommended. I’ve read “City of Orphans” and “The Secret School” by Avi and really enjoyed them. I like the history in the books. I’ll have to read these too – sounds like I’d really like them! I haven’t read “City of Orphans” yet, but I’m trying to work my way through all Avi’s works (slowly). He’s simply superb. It’s all good, Pat. I’ve been buried in track meets lately and haven’t even been able to make time to write lately. Our last meet is this Saturday. I love it, but the 8 hour Saturdays and 4-6 hour weekdays are wearing thin! Sounds interesting. Though I’m long, long past the recommended age group, I think I’ll give the first book a try and go from there. After all, I have enjoyed reading young adult books for years…maybe I’ve never grown up. 🙂 Great review, by the way. Definitely piqued my interest. I’m not much interest in growing up either, if it means leaving children’s lit behind. Thanks for commenting, W. K., and enjoy Crispin. Avi is absolutely my favorite children’s author. Lol, I know all about those endless reading lists. So many awesome books, so little free time. I’m glad to meet you, Kathy.